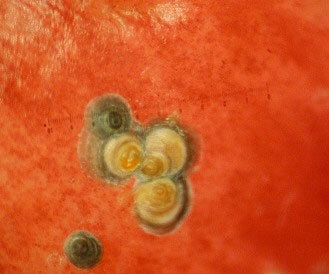 Have you ever noticed these small, circular red spots on nectarines, peaches or apples? 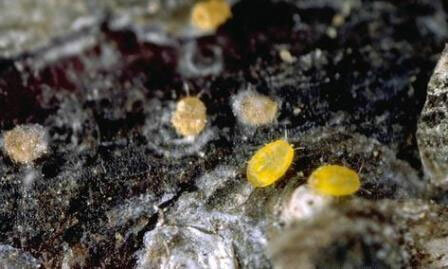 The defect is called “Scale” or “San Jose Scale” and is caused by an insect. When you come across this defect, you do not see the insect, but the effects caused by its feeding. The scale insect leaves this very distinguishable red ring, from feeding. Scale refers to a very large superfamily of insects called Coccoidea. According to the ScaleNet website there are 28 families of scales comprised of 7,355 species. Most scale insects are female. Mature females are wingless and often secrete a hard shell-like covering for protection. The males are rare, small, non-feeding, and short-lived but look more like other insects as they have wings. The adult female is yellow (as shown in the image above) and is about the size of a pinhead. It lives under a protective cover that form over it as it grows. The adult scale is stationary most of it life. Only the newly born nymphs, called crawlers, move about on the tree. The crawlers are yellow and are born alive. The image above depicts a closeup of the adult female, with its protective covering or shell. The fruit may become infected with the scale because female San Jose scales give birth to living young that emerge from under the edge of the scale covering. These tiny yellow crawlers wander in a random fashion until they find a suitable place to settle. Immediately upon settling, the crawlers insert their mouthparts into the host plant/fuirt and begin feeding and secreting a white waxy material (white cap stage); eventually the waxy covering turns black and is known as the black cap stage. Later the covers turn various shades from gray to black. So, from an inspection standpoint, is this a defect? Yes, whether you come across the scale still attached to the fruit, which you rarely see, or the red rings from the scale’s feeding, it is still a defect. For nectarines, the fruit is considered to be damage if you find more than 3 scale marks on the nectarine, or the aggregate area of the marks is greater than 1/4 inch. Since these spots due not grow, or change in color, they are considered a quality defect. 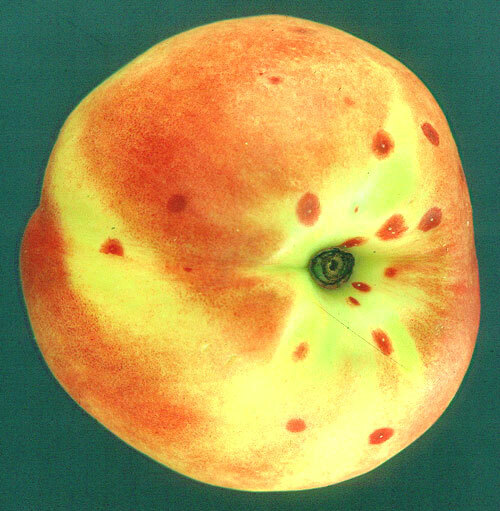 The U.S. Grade Standards for Nectarines allow 8% quality defects, for the U.S. No. 1 Grade.